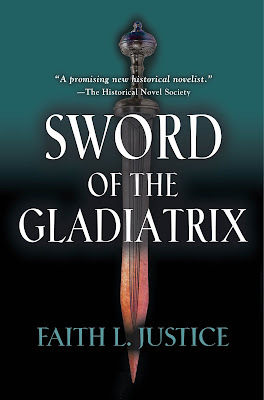 This week, we're pleased to welcome author FAITH L. JUSTICE with her latest historical fiction release, SWORD OF THE GLADIATRIX. Join us again on Sunday for an author interview, with more details about the story behind the story. 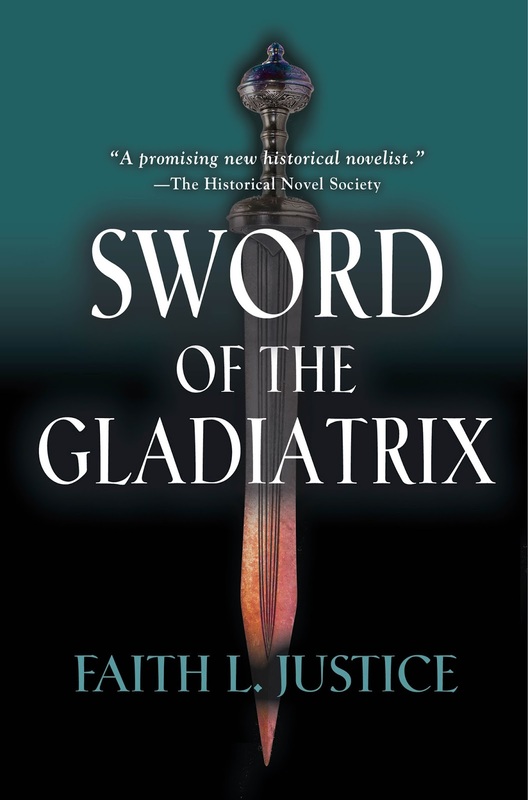 One lucky visitor will get a free copy of Sword of the Gladiatrix. Be sure to leave your email address in the comments of today's post or Sunday's author interview for a chance to win. Winner(s) are contacted privately by email. Here's the blurb. Afra watched with her fellow Kushites, as the small contingent of Roman soldiers escorted General Decimus Cornial Asina through the streets and plazas of the Kush capital of Meroe. The setting sun washed the city in bloody light—an ill omen. As their guide from the Egyptian border, she should have tried to delay the Romans till morning, a more auspicious time for new beginnings. She shook her head. Leave the auguring to the priests. Only they can determine the will of the gods, what is auspicious, what is ill-omened. Besides, the General had been most insistent on setting the pace. Any ill-luck is his own. The blare of curved horns—what the Romans call buccinae—announced the Roman presence at the palace. Bright limestone steps led up to a colonnade sheltering a massive wooden door, flanked by monumental stone carvings of the king on one side and the queen on the other; both smiting their enemies with flails and spears. The red sun reflected off the soldiers’ burnished breastplates and sharp spears. Kashta, the king’s chief advisor, and his own entourage of aides and guards, met the delegation with their own fine show of trumpets and drums. Among them, Afra spotted Piye, Kashta’s son and her step-sister’s husband, dressed in shimmering striped robes. His hooked nose curved over a cruel mouth. Her stomach roiled and her lips unconsciously curled into a snarl. General Asina gave the briefest of bows. Afra knew he would take the King’s absence as a slight on his honor. Her people knew the absence of the queen was just as great an insult. Perhaps it was meant to be. If so, it was a dangerous game to bait these Romans. Kashta did not bend his neck. “My Qore has had accommodations prepared for you, but asks your pardon for his absence. He has duties in the temple of Amun and will greet you properly at a feast in your honor after you have rested and refreshed yourselves.” Asina gave him a stiff nod and ordered his men to camp outside the walls. An honor guard accompanied him to his more comfortable accommodations. The Romans marched off and the crowd dispersed, muttering. One young man spat in the street as the Romans left it. Three women with kohl-rimmed eyes watched the soldiers retreat; speculative smiles on their faces. Afra shrugged as the women drifted down the street in the Roman’s wake. Everyone had to eat. If not for her hunting skills, it might be she following the Romans to their beds. The thought made her shudder. Thank you Mother Isis, Queen of all Gods, Goddesses, and Women for saving me from that fate. Afra walked across the plaza fronting the palace and the brightly painted Temple of Amun, wondering if she dared visit her step-sister before retiring for the night. She lived for Asata’s smiles and loving embraces, but it was dangerous meeting too often. Her rumbling stomach and a whiff of rancid odor decided for her. Dinner, then a wash.
She didn’t make it to her room. Afra entered Kandake Amanikhatashan’s private receiving chamber through a small back entrance used for servants and others with more clandestine charges. Afra had used that entrance more than once doing the queen’s bidding. The room opened on an interior courtyard which, during the day, provided bright light and cooling breezes. Now the room glowed in the soft light of oil lamps hung from the ceiling. Coals in a brass brazier chased off the night chill and gave flickering life to the frescos of Nile plants and animals on the wall. The queen entered and Afra abased herself on the soft wool carpet. “Rise and be seated. Take some refreshment.” In the tradition of Kushite queens, Amanikhatashan was an immense woman—shorter than Afra by a head, but three times her girth. Her dusky skin glistened with oil; her ears, hands, and arms glittered with gold ornaments. A gold pectoral decorated with blue faience rested on the substantial bosom of her white linen gown. She had not finished her preparations for the Roman banquet. The queen’s shaved head awaited the elaborate wig and headdress reminiscent of the ancient Egyptians her ancestors had once ruled. Afra perched on a chair decorated with blue-green cushions made of a smooth material that felt like water gliding over her fingers—silk it was called, from lands beyond the east sea. She reached for a blue glass goblet filled with cool wine but left the plate of sliced melon untouched. The queen settled on a more substantial couch and clasped her hands in her lap. Afra lowered her eyes and awaited the queen’s pleasure. Afra bowed her head in acknowledgment. She had seen but eighteen summers when her step-mother drove her from home, calling her abomination. These last two years, serving her queen, allowed her hope of a future with Asata.